I am studying Eric Butterworth’s In the Flow of Life and thought I’d share wisdom found in this book. 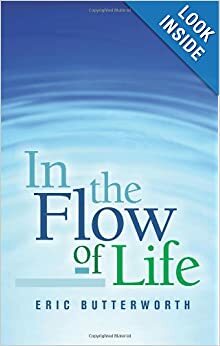 I am studying this great text on being in alignment with the flow of life, by Eric Butterworth. You can get this in digital or paperback form on amazon.com or barnesandnobles.com. Whether you’re feeling good or bad, ask yourself whether or not you’re in the flow of life. Taking a quick moment to gauge where your heart and mental space is will help guide you back to the flow of life. You will begin to recognize your Inner Knowing and be able to discern the difference between outside voices and the still, small voice of your intuition speaking to you. The Inner Knowing is the same innate knowing birds have when it’s time to fly north or south – they just know. The same innate knowing is in you. You know your authentic self and that you’re in an ever abundant Universe, but sometimes that Divine Wisdom is covered by lies and limiting beliefs that dull that light inside you. Keep a small journal you can carry with you to notate the blessings you encounter each day, which can be scribed evidence of your alignment with Source. Use a recorder to capture thoughts, feelings, blog ideas, and passages for the novel I’m writing. Cell phones have app recorders, so the next time you have a moment you want to remember, record it. We have to deconstruct old limiting belief structures and rebuild with new beliefs that serve us. Whenever there is a diminishing thought, there is an old belief structure that needs to be torn down. When you find yourself out of alignment with the flow of life, remember all you have to do is take a moment, step back enough to see the situation for what it is – a blessing that is guiding you back to the direction you want to go in. Become the observer of you and your situation. “…If we do not build on the consciousness of our source in the universal flow of life, we try to make the law work for us in the form of the good we desire. Actually, there is no way we can make divine law work for us or for any one. Can we influence gravity to work for us or the sun to shine on us? All we can do or need to do is get into a right relationship with them. Divine Law is indiscriminate and it is you or I that has to align to the flow of life – not the Universal Laws bending and changing for an individual person. Just as we’re aligned with the Law of Gravity, we can get our internal navigational system aligned with Law of Attracting, the Law of Allowing, or the Law of Healing. Prayer transforms our mind, heart and spirit so we can easily align with the Flow of Life. The Flow of Life will continue to move regardless of whether we believe or not and whether we pray or not. Focus on what it is you that you do want. If it’s world peace, you can’t serve two Gods – peace and war, by wishing (lacking) for peace, while all you are focusing on is the strife in the world. You have to align to peace, to become the peace you desire. On a less grander scale than world peace, you can get into the flow of what you want in your own life and to steer your focus on what you don’t want to what you do want – it is really that simple. God wants us to recognize our power, because it is then we are able to truly shine His light through our gifts and talents to share with others, so we all can benefit, grow and be utterly happy.